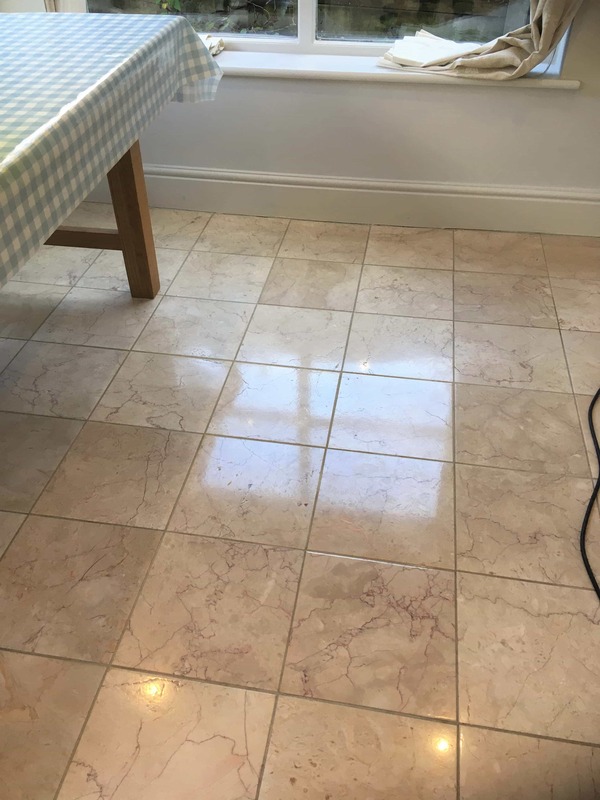 This customer in Middleton near Manchester wanted to bring the shine up on the tiled floor in their Kitchen and Dining Room, it had been laid nearly fifteen years before and was now dull, lifeless and the grout was also in need of a clean. I was told the tiles were Ceramic however after visiting the property and running some tests if became clear that the tiles were in fact Marble. 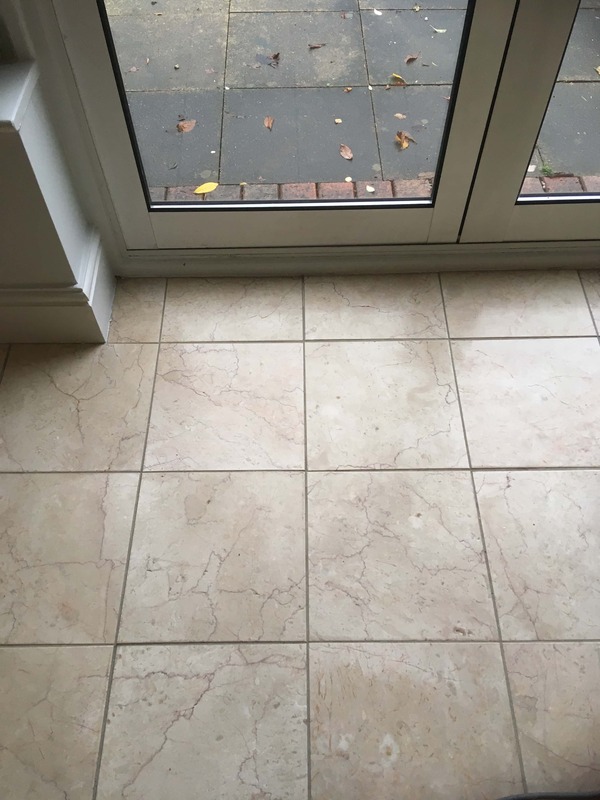 There are some very realistic Ceramic and Porcelain tiles on the market however you usually find they have a set of repeating patterns whereas with natural stone no two tiles are the same. 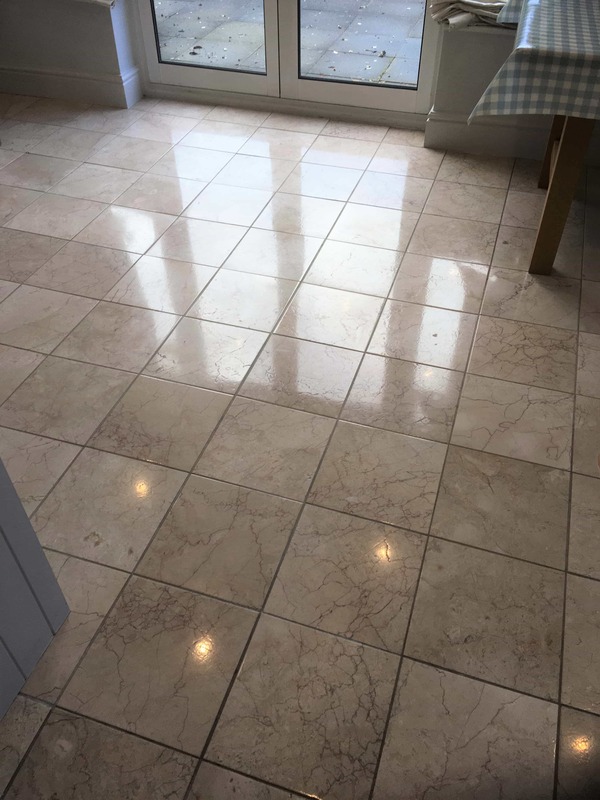 The floor had lost its shine over the years which is a common problem with natural stone such as Marble which ideally needs to be polished and have the sealer topped up every year to keep it in the best condition. The cleaning test results were so good that the customer booked us in to complete the floor straight away after agreeing the quote. 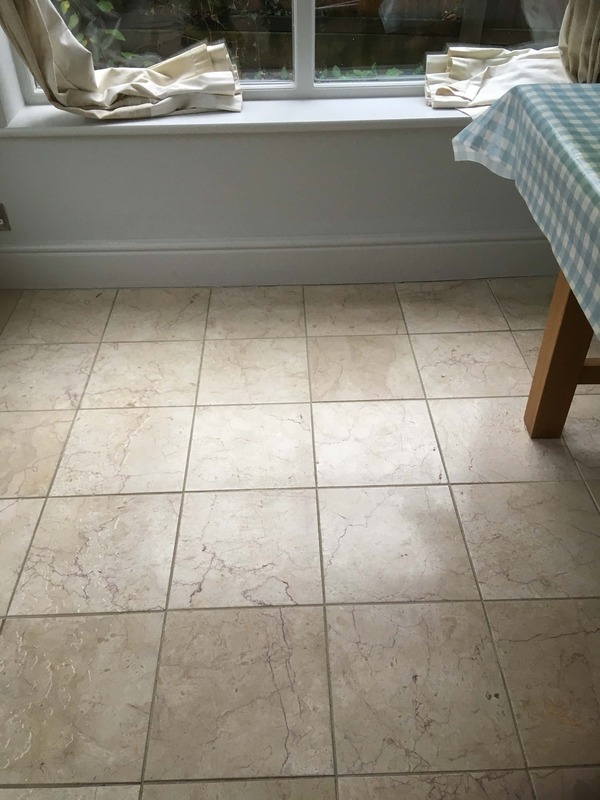 We started by giving the floor a general clean with Tile Doctor Pro-Clean paying special attention to the grout where it was scrubbed in along the grout lines using a stiff narrow brush. The soiled cleaning solution was then rinsed off and extracted using a wet vacuum. The next step was to clean and re-polish the Marble using the 400, 800 and 1500 grit burnishing pads which re-hone the stone bringing up the polish gradually. You use water to lubricate the process and rinse with more water in-between each pad to rinse off the soil that is generated. The soil is then extracted with a wet vacuum. After running all three pads over the floor in sequence and the floor was left to dry off overnight and I returned the next day to complete the work. On my return I started by running over the floor with the fourth burnishing pad in the set which is a very fine 3000-grit pad. It’s applied with a little water sprayed onto the floor using a technique we call a “Spray Burnish” and it really brings up the polish on the Marble tiles. The last step was to seal the Marble tiles which will protect them from dirt becoming ingrained in the pores of the stone and make them easier to clear. For this I chose to use Tile Doctor Colour Grow which is an impregnating sealer which has the added benefit of enhancing the natural colours in the stone. It was the perfect choice for the floor and the final result was quite a transformation. Certainly my customer was very happy with the results and left the following feedback on the Tile Doctor feedback system. Before leaving I discussed aftercare and explained that the more a polished floor gets used the more the shine and sealer wears off, so I always advise having the floor re-polished once a year using the 3000-grit pad and then adding another coat of sealer. My customer agreed and has already booked me in for a years’ time to do the work which should only take about two hours. 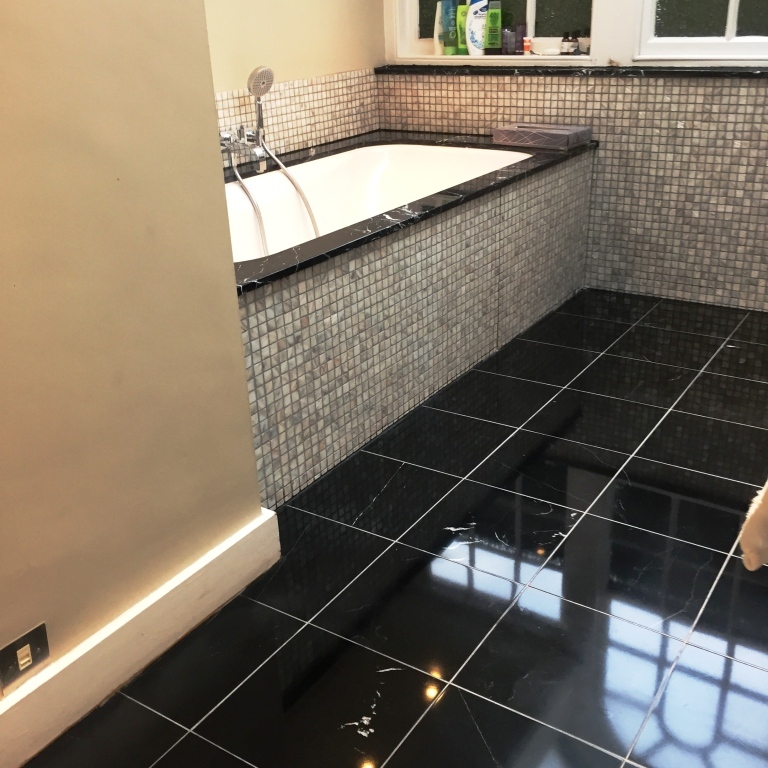 This customer in Baldock, North Hertfordshire has a beautiful Black Marble bathroom floor which unfortunately was far from looking its best due to a build-up Limescale. Normally this can be removed with an acidic cleaning product however Marble like all natural stones is acid sensitive would be damaged in the process. The only way to remove the Limescale would be to polish it off using a set of diamond pads which would also restore a high shine finish to the Marble floor tiles. The first step before starting the process was to cover the threshold edges, skirting’s and doors with tape to protect it from splashing etc. 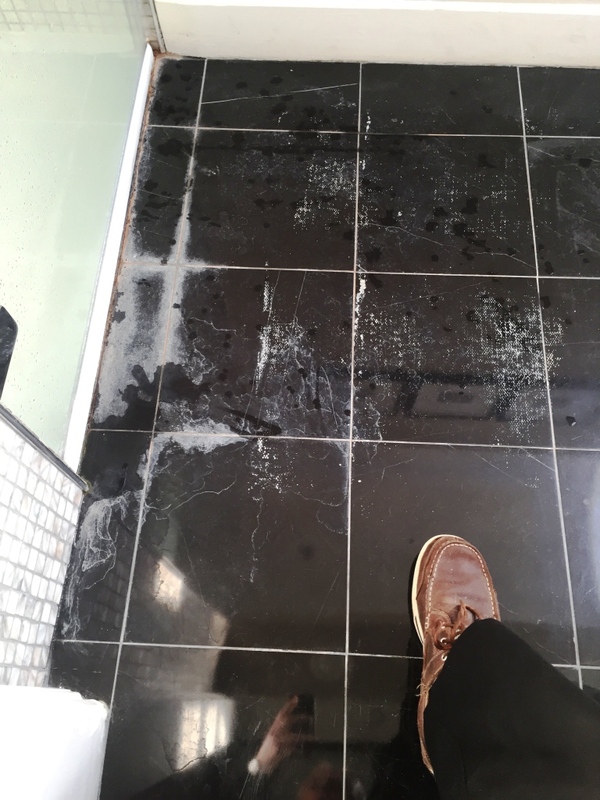 Next we used a medium dilution of Tile Doctor Pro Clean which is an alkaline tile and grout cleaner with hand brushes to clean-up the thin gout lines and remove any grit from the floor. The floor was then rinsed with fresh water to remove the now soiled cleaning product and also steam cleaned to neutralise floor. The water was extracted from the floor using a wet vacuum. To bring back the natural shine we honed the floor using a series of diamond-encrusted burnishing pads. Firstly, I applied a Coarse 400 grit pad to strip away what remained of the old sealer and Limescale, rinsing the floor afterwards. I then applied the Medium 800 grit and Fine 1500 grit pad to gradually close the pores of the stone which, in turn, restores the polished effect. Again each pad is used in combination with a small amount of water and any excess moisture is removed with a wet vacuum. The final 3,000 grit pad brings up a really deep shine and is applied with small amounts of water sprayed onto the tile. After drying the floor the Marble tiles were sealed with two coats of Tile Doctor Ultra-Seal which is a natural look sealer that doesn’t alter the appearance of the stone and protects it from staining by occupying the pores in the stone. The last step was to buff the Marble tiles with a white buffing pad. The floor now looks fantastic and you can really see your reflection in the shine of the black Marble tiles.